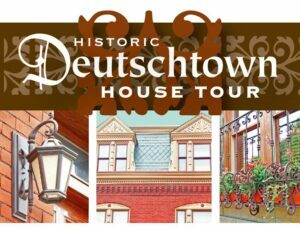 Every few years, Deutchtown residents open select homes for our Historic Deutschtown House Tour. The 2016 Historic Deutschtown House Tour was on Sunday, September 25, from 11 a.m. to 4 p.m. Our self-guided tour featured distinctive restored homes, many built in the late 1800s, along with some modern surprised. Tour-goers could expect a diverse array of interiors, architecture and styles, as well as beautiful gardens. To get a feel for what to expect, view a photo gallery of the tour in 2014. Tickets were $18 in advance. If you purchased a ticket online, your name was on a presale list at the check-in table. Tickets purchased at the check-in table were $20. Check-in for the tour was in the municipal parking lot near the new Deutschtown mural, located on the side of the building at 507 Foreland Street, Pittsburgh PA, 15212. Parking in the municipal lot and on the street was free. Of note for the 2016 tour is that 100% of the net proceeds were donated to the Allegheny Commons Park! This contribution will aid in efforts to rebuild the northeast fountain, which is original to the park’s 1869 design. Read more about that project here. Questions? Contact Gina Grone at ginagrone@gmail.com or 412-626-1832. Copyright © 2017 Welcome to Deutschtown. All rights reserved.